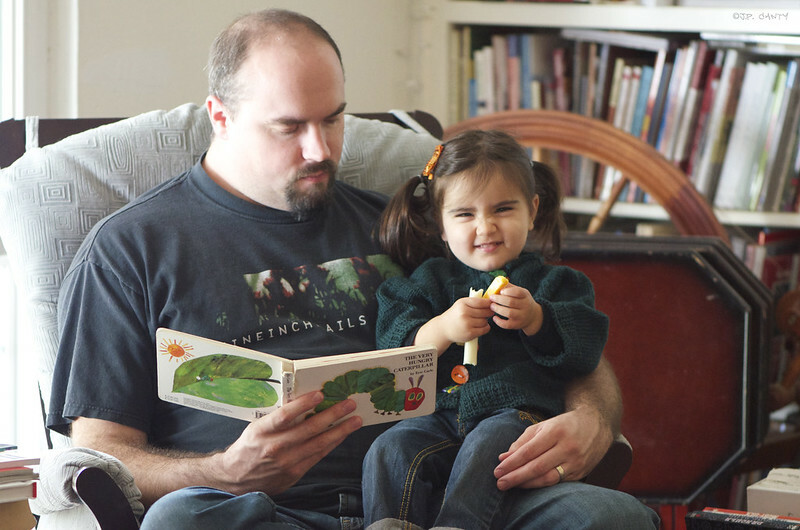 KidBrotherSam and I both loved The Very Hungry Caterpillar as kids (and The Very Busy Spider , as well, for the record). One of my favorite things about being a parent is sharing things that I loved as a kid with Genevieve. Specifically, books. I come from a family of "readers"- we had bought a library of books for Genevieve before we had clothes, diapers, or furniture. Reading is, obviously, a priority for us. 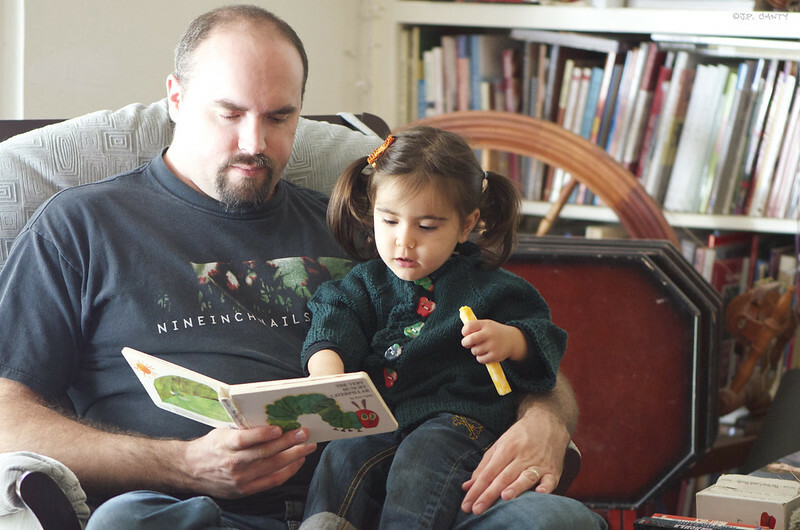 Ever since Genevieve has become independently mobile, we have had a rule: if someone is reading to you, you need to sit on their lap. (Or snuggle up next to them.) This works on a number of levels: we get the (increasingly rare) snuggle time, and she learns to sit and focus on one thing at a time. Also, snuggles. We are mostly moved out of board books, which makes me both sad and glad; sad that she's not a little baby anymore, glad because I don't find myself saying things like "Books are for reading. Let's get you a chewie for your teeth." If you read a DangerMouse "The Very Hungry Caterpillar", you might find Cascade Greenland on sale, in a nice, leafy green. 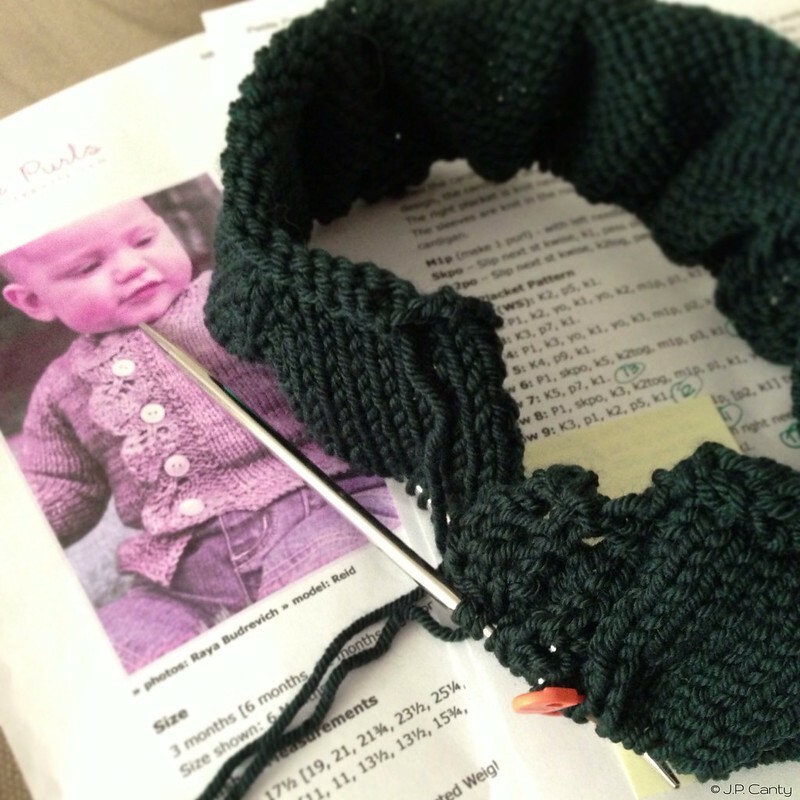 Once you have nice, leafy green yarn, you will find the pattern for a sweater with a leafy buttonband. Once you knit the sweater with the leafy buttonband, you'll block the sweater. 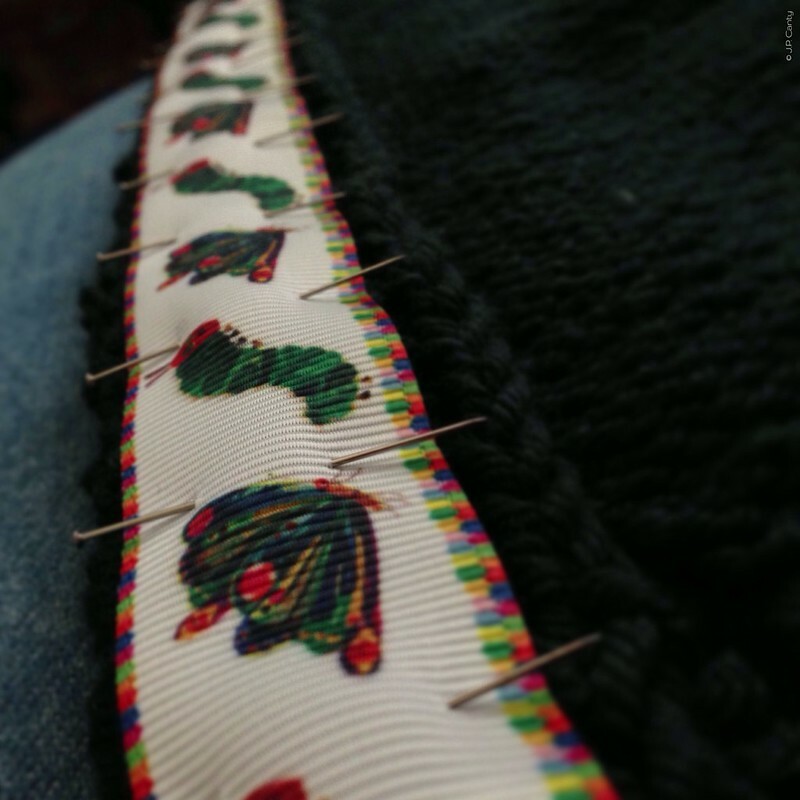 Once you block the sweater, you'll need matching grosgrain ribbon to back it with. 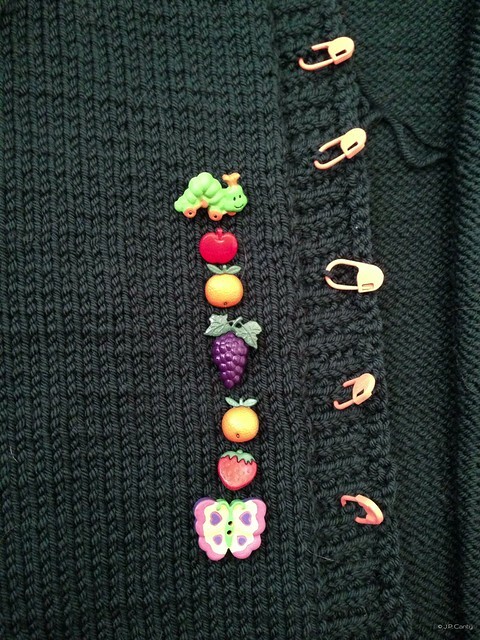 Once you have applied the grosgrain ribbon, you'll need thematic buttons to match. I know that he didn't eat grapes. Once you find those buttons, you'll have an AMAZINGLY talented listener make you special buttons which blow the other ones out of the water, so you'll put those on instead. 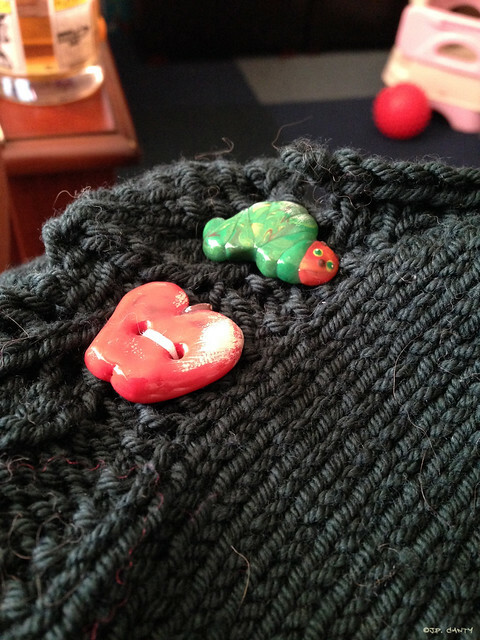 Once you apply the Special Buttons, you wait for the weather to accommodate the wearing of a sweater, and then stealthily snap a couple of pictures of a DangerMouse in her Hungry Caterpillar sweater. The holes are great for counting. And sticking fingers in. And it's not a picture, if you don't Gopher Grin. ...You might need to knit an "If You Give a Mouse a Cookie" sweater. Oh, she and the sweater are so cute. As is your husband too. Clearly a literate family! That sweater is adorable! Yay for books! So very lovely. The sweater I mean, no wait, I mean the baby, oh and the books. Okay starting again. This was a lovely post. Now I must say I AM looking forward to the cookie sweater....... Smile. Great pictures! The buttons are amazing. Rainy weather means wearing beautiful handknits and the opportunity for long reading sessions! 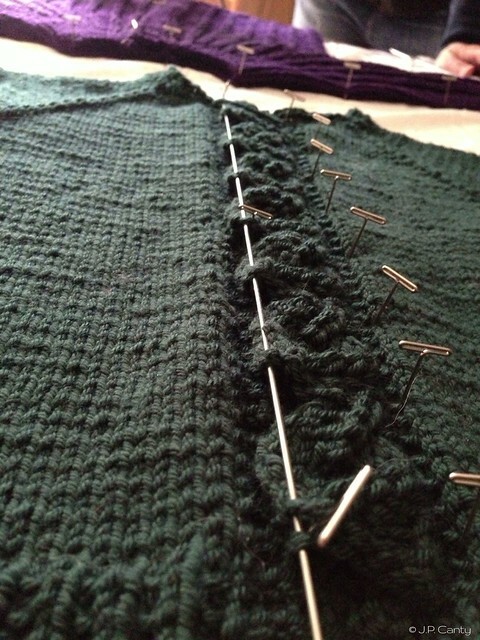 The Cascade sweater is adorable to begin with, but those buttons put it over the top! Amazing!! So adorable! Those buttons - just no words for how cute. My niece and nephew are two and a half and my niece gives the gopher grin too, although I never had a name for it until now!